We can now shoot 360 photos directly from the Facebook app. But creating them perfectly isn’t really the easiest thing in the world. Facebook wants to help. If you’ve ever tried to create a panoramic photo on your phone, you’ll know that it’s easier said than done. There is a high probability that it won’t come out straight. With the recent addition of the ability to shoot 360 photos from the Facebook app, this problem comes to light once again. But Facebook seems to have a plan, and has announced that it’s working on a fix. 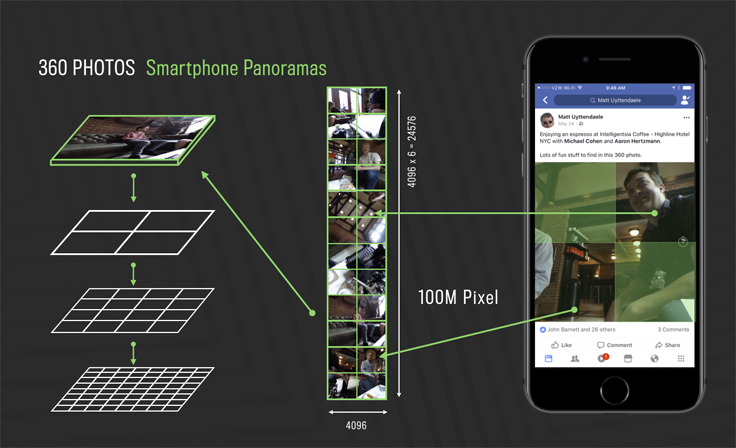 In a Facebook code post last week, Matt Uyttendaele, a Research Scientist at the company shared a new program that works with AI to straighten your 360 photos that were taken in less than optimal conditions – i.e. your camera wasn’t held perfectly parallel to the scene. It turns out that an automatic fix using computing is really not easy. If a scene contains no lines, tools find it hard to figure out how to straighten it. Can’t take a straight 360 photo? Facebook might have an AI fix for that soon. Also, 360 photos are slightly more challenging. There is more data to parse than a usual image, and they are formatted to immerse viewers. So, a horizon is skewed. By teaching an AI to correct purposefully skewed images, Facebook‘s researchers were able to make it correct 360 photos as well. Facebook hasn’t implemented the feature yet, but we can only assume that it will do so soon, as more users are starting to use its 360 photos features. The company also recently implemented an automatic fix for shaky 360 Live video.